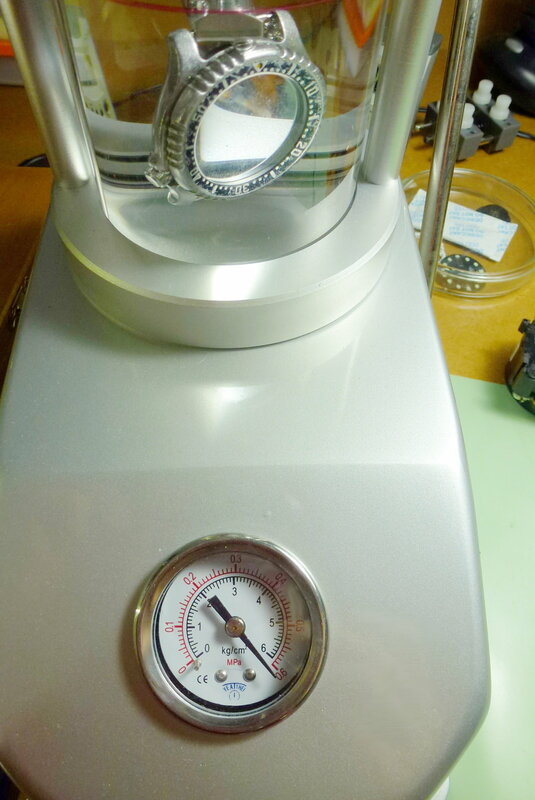 There is a dial under this crystal...really. 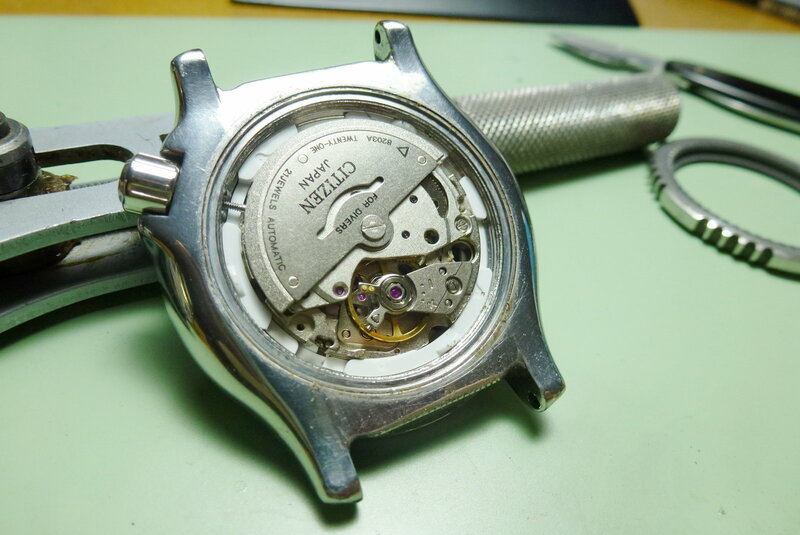 The six digit caseback number - this time - starts with "706" -> As it stands for the year in the production decade followed by the production month, this watch should have been produced in June 1997. 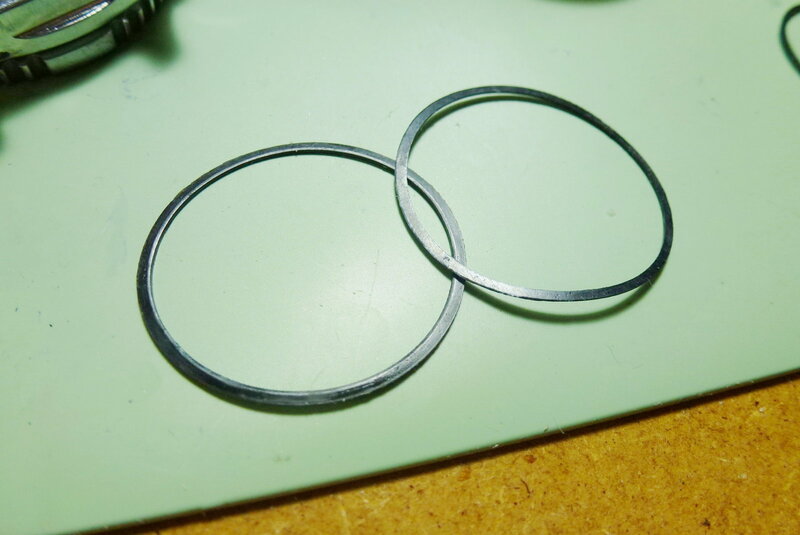 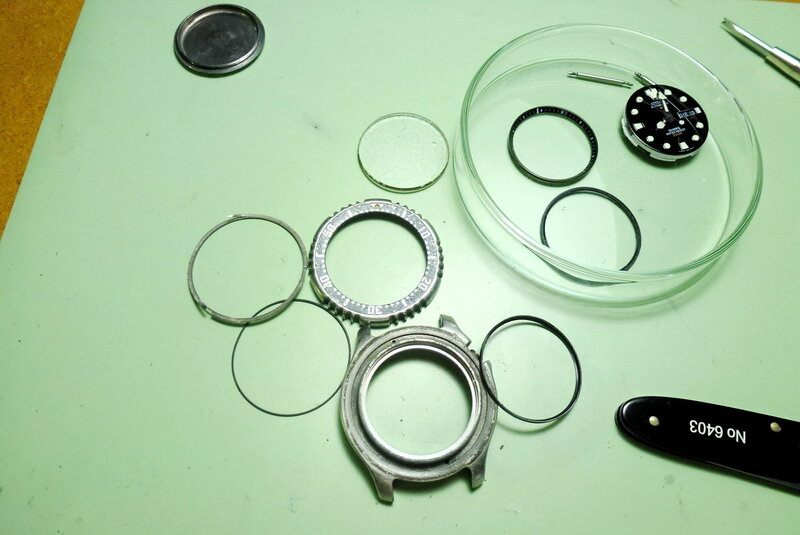 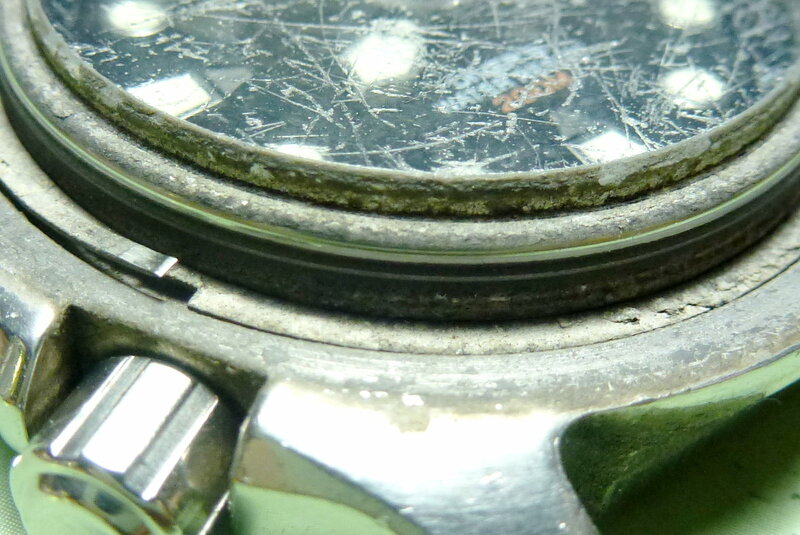 Under the worn bezel ring we find a mixture of dirt and metal filings. 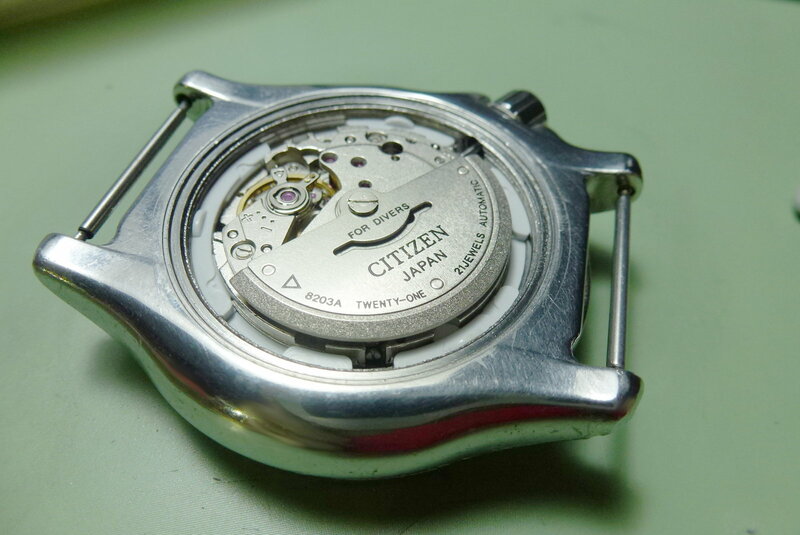 The Citizen Miyota 8203A movement looks good as often in a well-sealed watch. 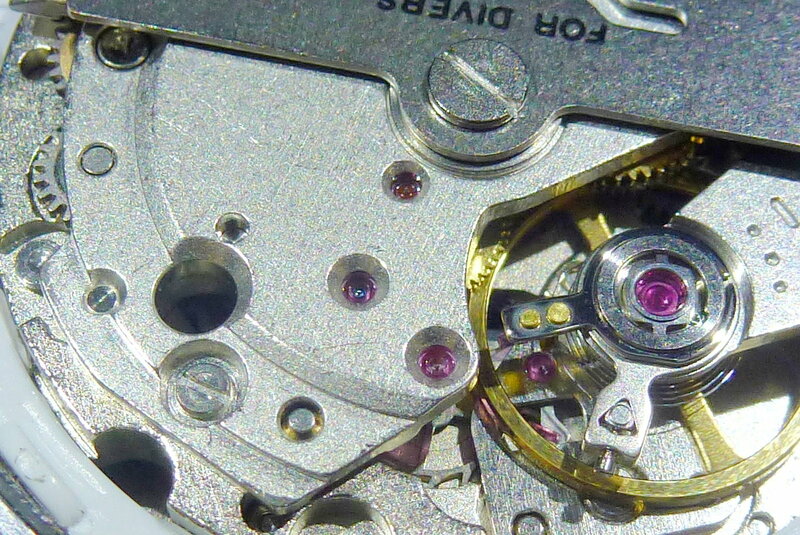 No words necessary - just cleaning. 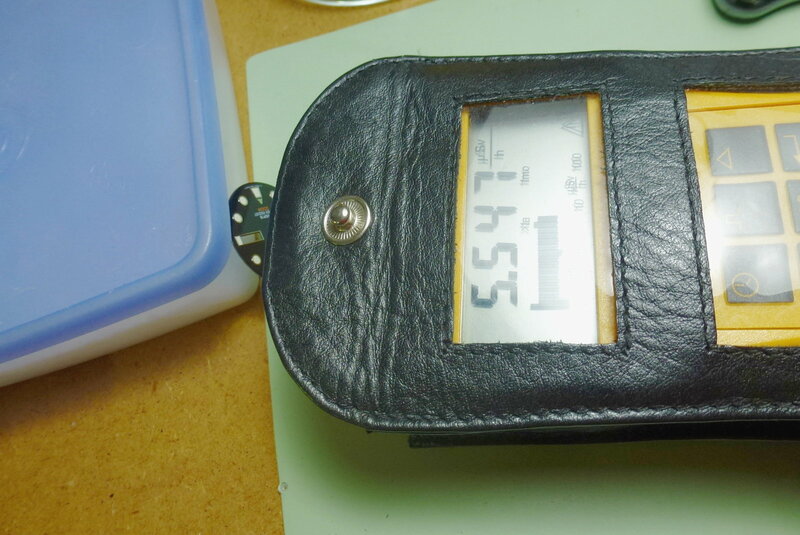 The day indicator is a German-English version. 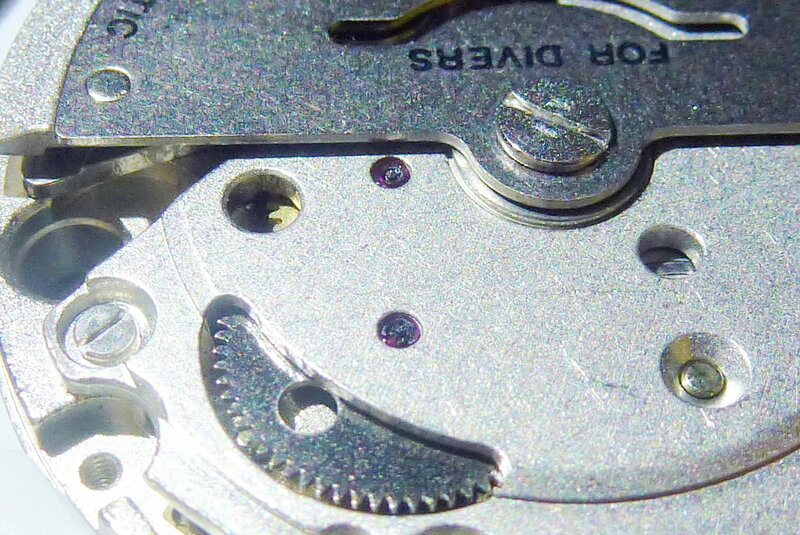 The day-date mechanism with quicksetting for both functions makes use of plastic parts where it makes sense. 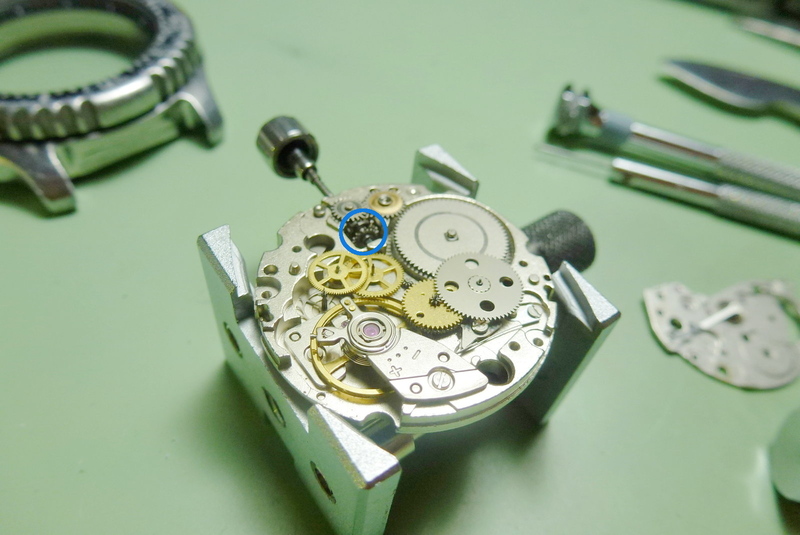 Just two parts make the heart of the day-date quicksetting mechanism (blue circle) -> the day-date corrector (right part) and its spring (left part). 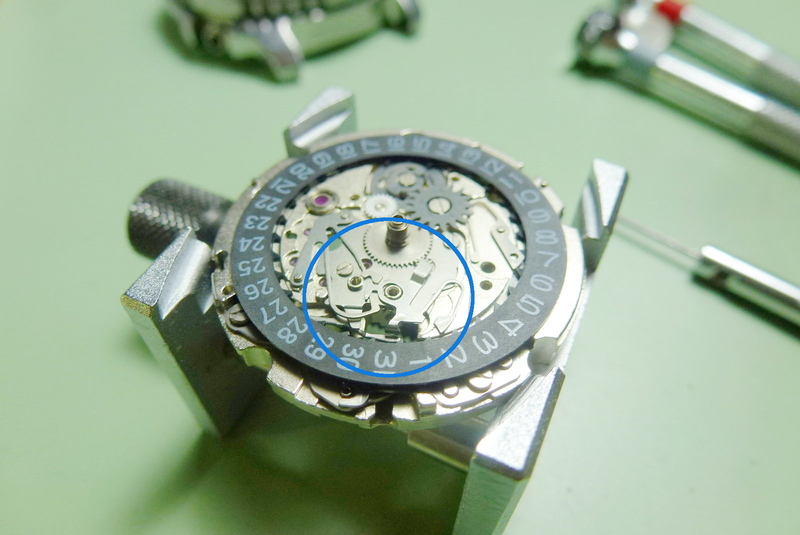 By turning the crown clockwise or counter-clockwise when in day-date setting mode, the clutch wheel (blue circle) engages with the day-date corrector which then either "increments" the day or the date by one. 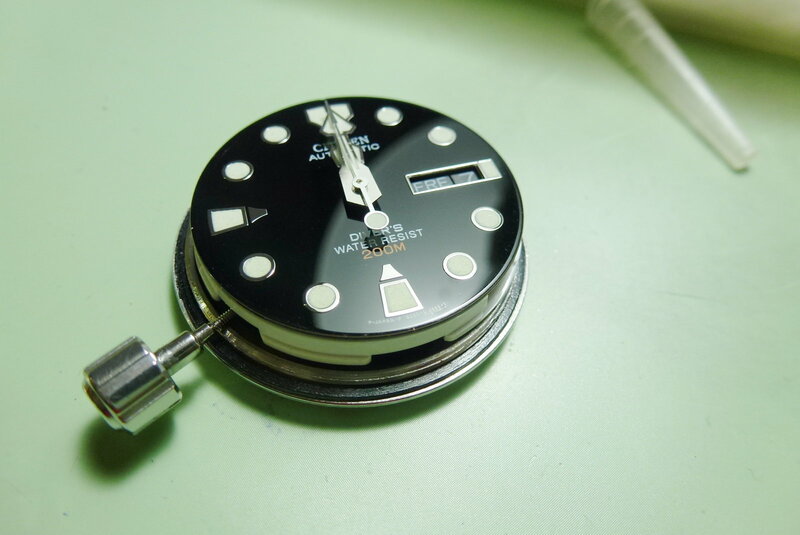 This is a marvellous implementation of this feature. 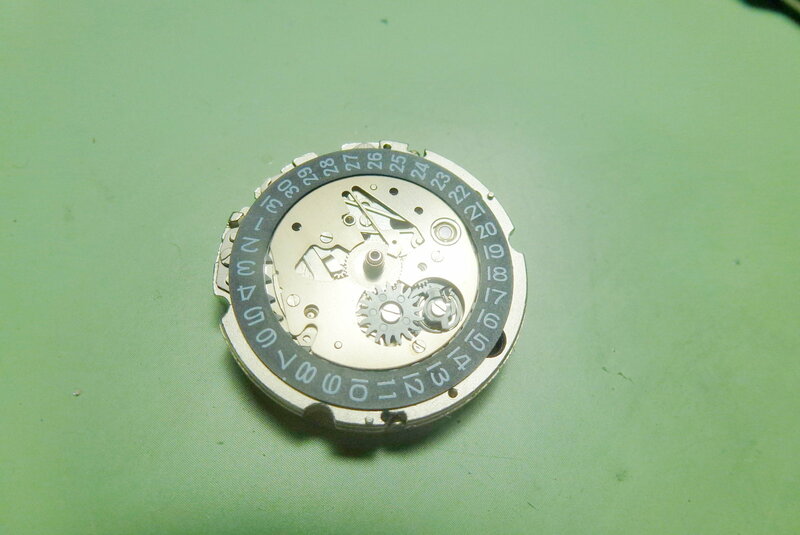 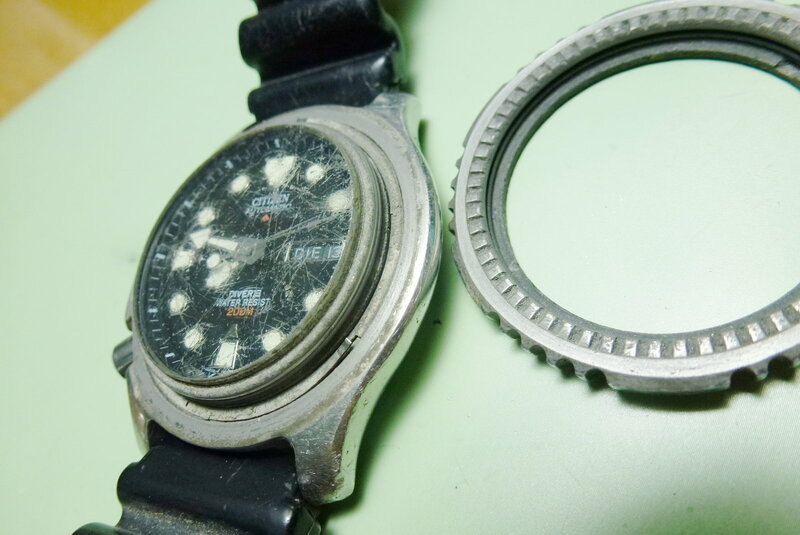 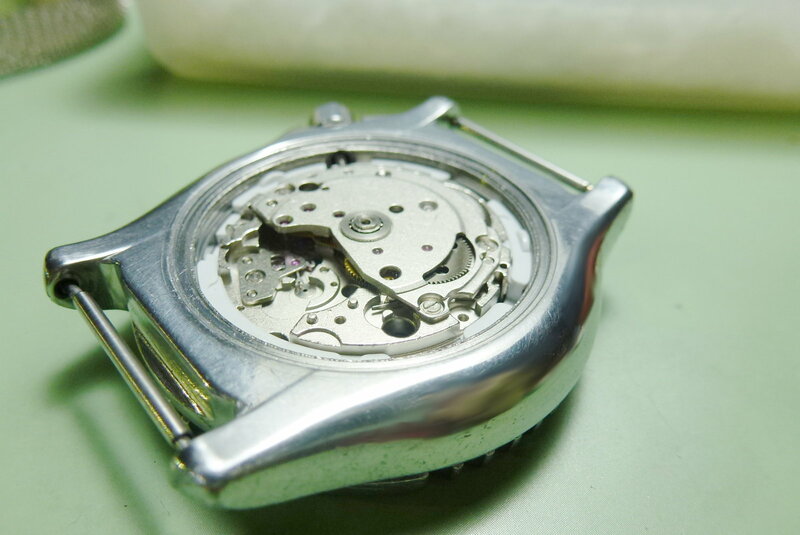 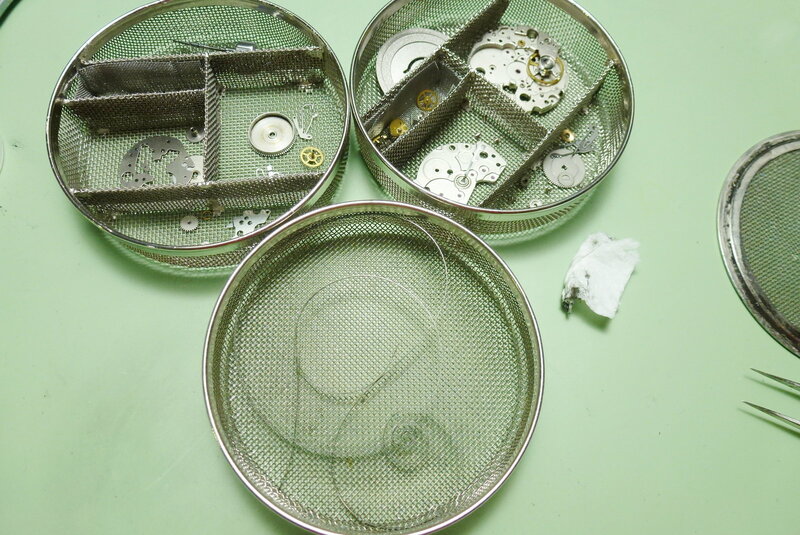 And with most of the parts removed on the caseback side. 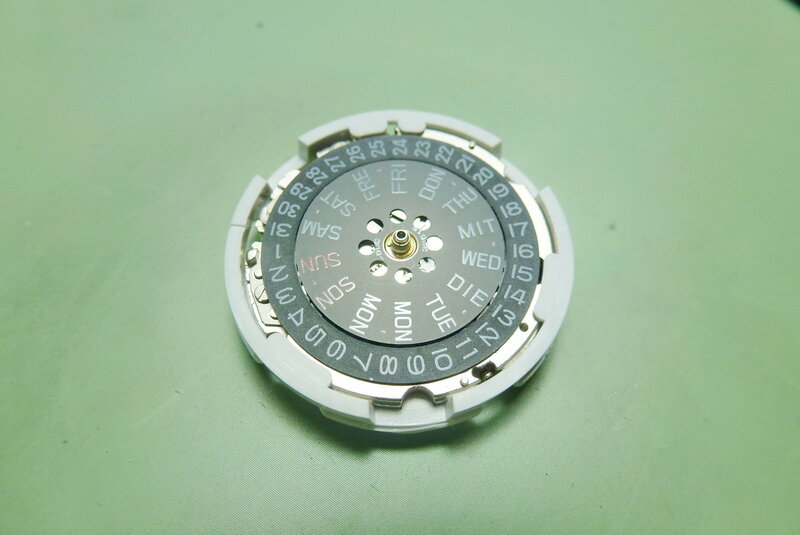 The grey plastic part is the day-date driving wheel (-> good design decision as it is easier / cheaper to produce as a comparable metal wheel and probably has better features like increased flexibility and "self-lubrication"). 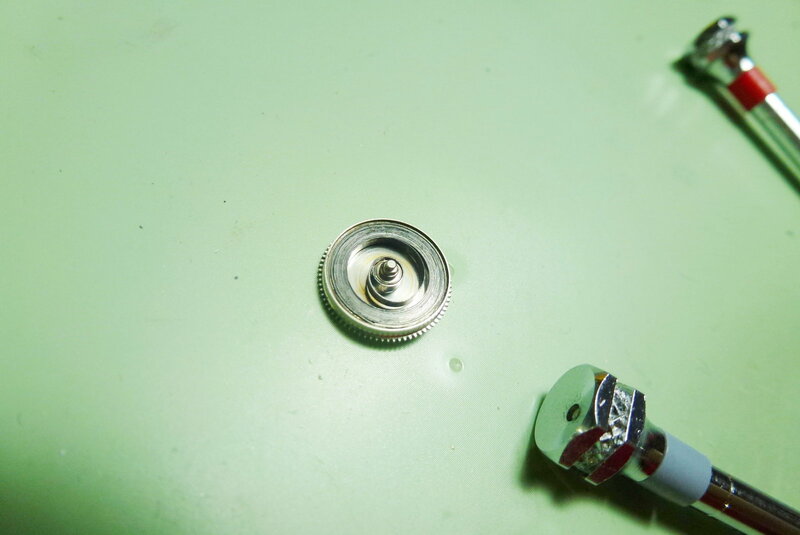 The mainspring in its barrel. 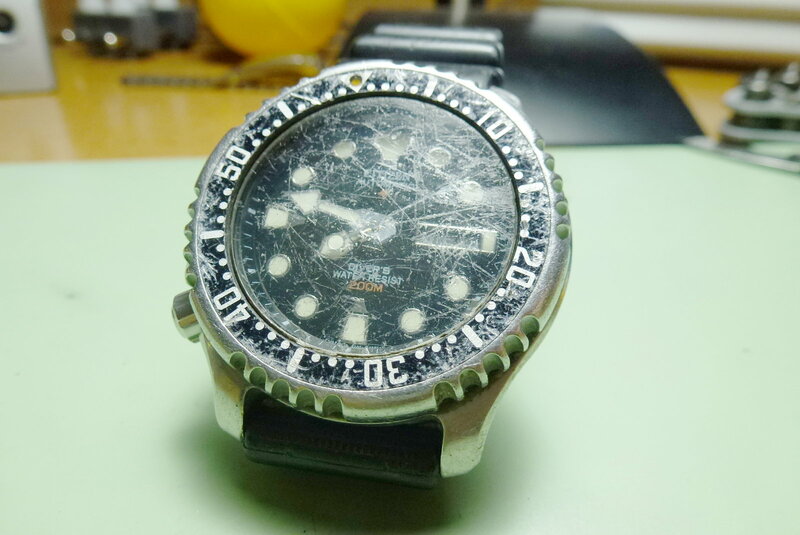 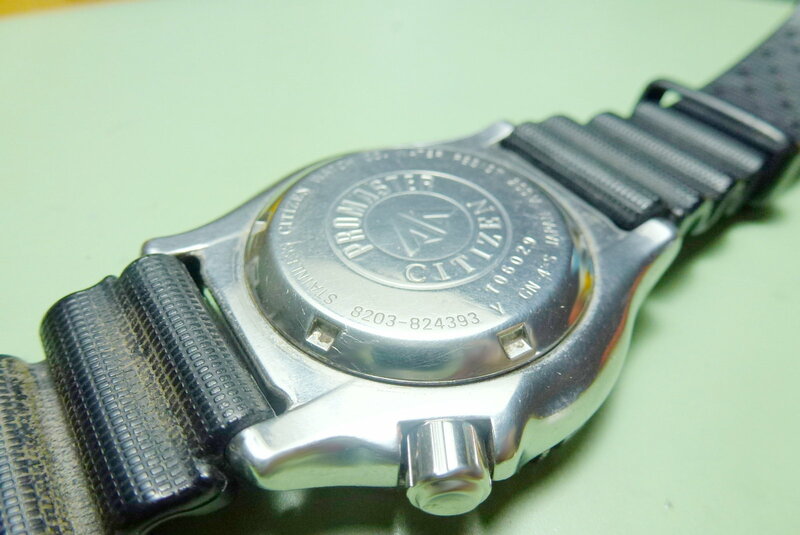 Citizen used tritium until the end of the 1990s and this watch apparently still has it in its hour markers (this is especially noteworthy as the latter have already stopped glowing but not emitting beta radiation -> this can be dangerous if you try to clean the dial or want to replace the lume!). 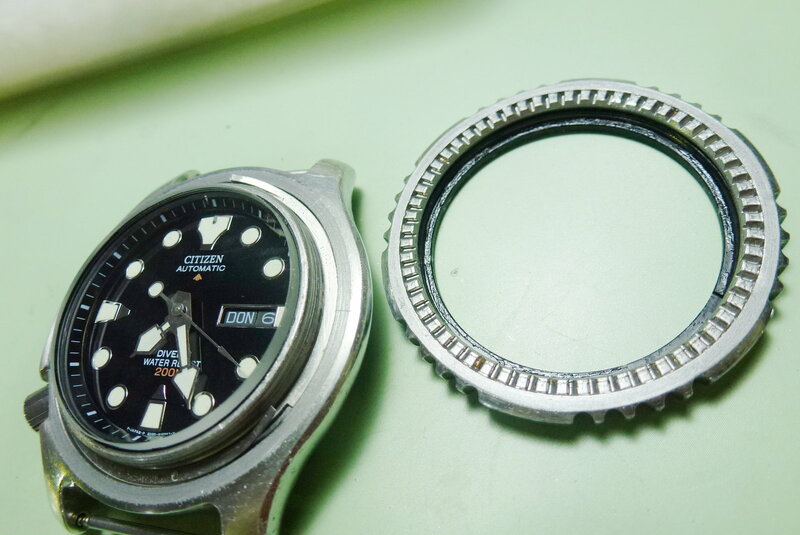 Testing the case under water / pressure (60m). 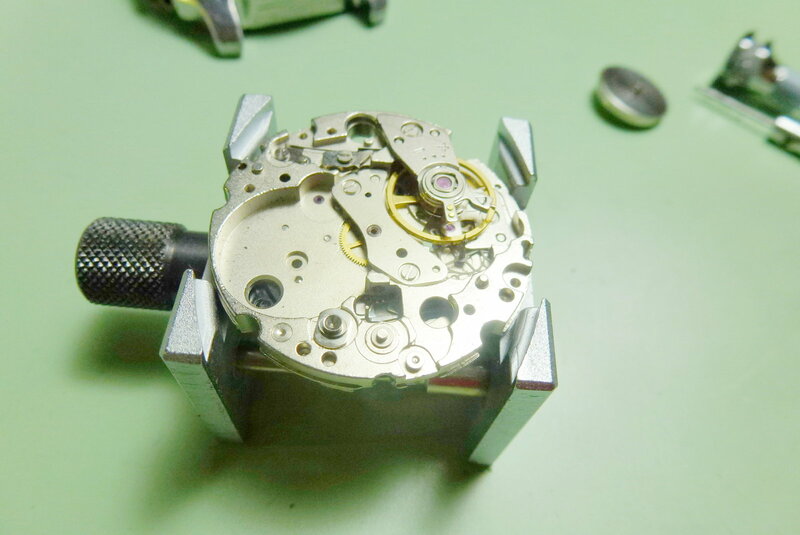 The partly reassembled and relubricated watch with its dial and hands refitted. 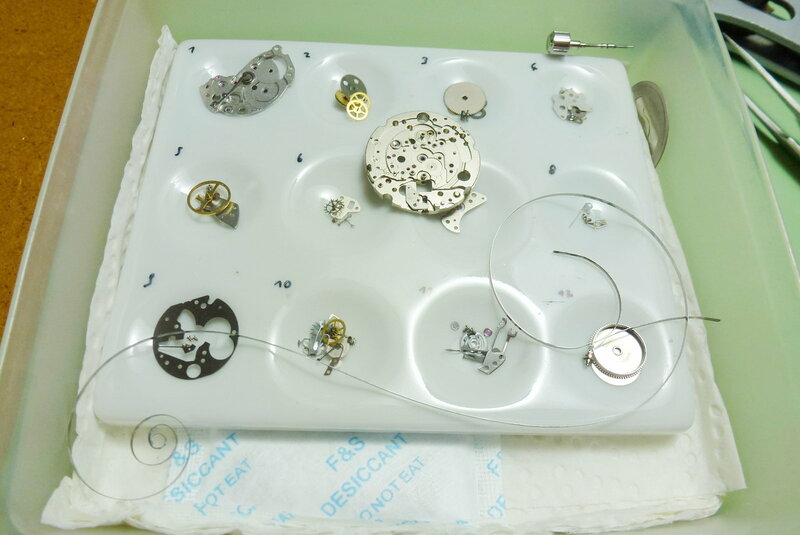 The rest gets done with the movement back in its case. 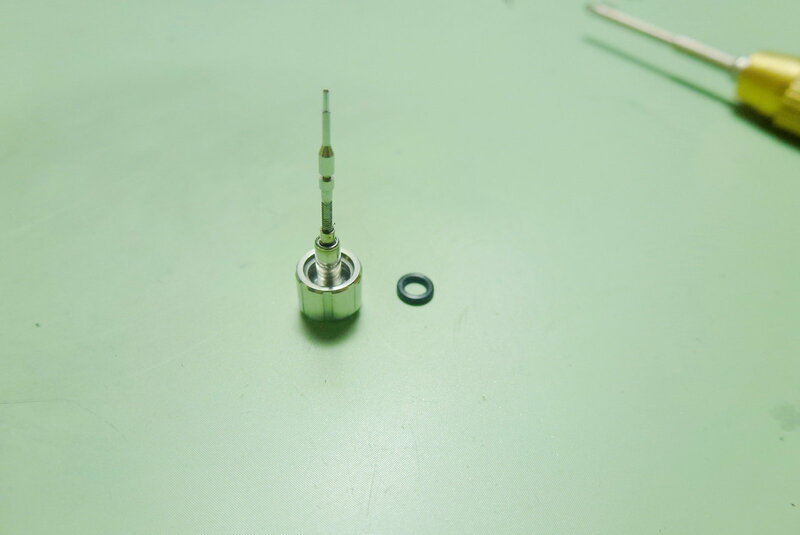 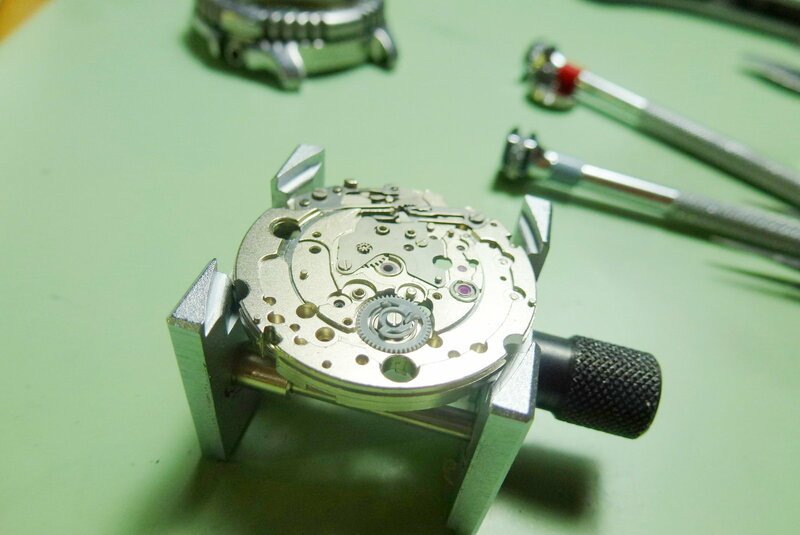 The watch in fully-working state. 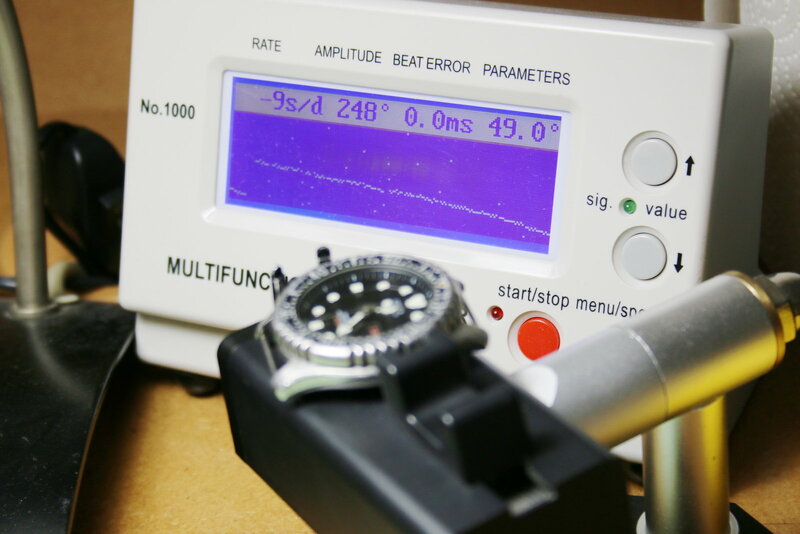 With the old mainspring re-used, the amplitude may be somewhat low but Miyota movements are very forgiving regarding this aspect (the scattered dots near the main line of the plot are just noise and can be ignored). 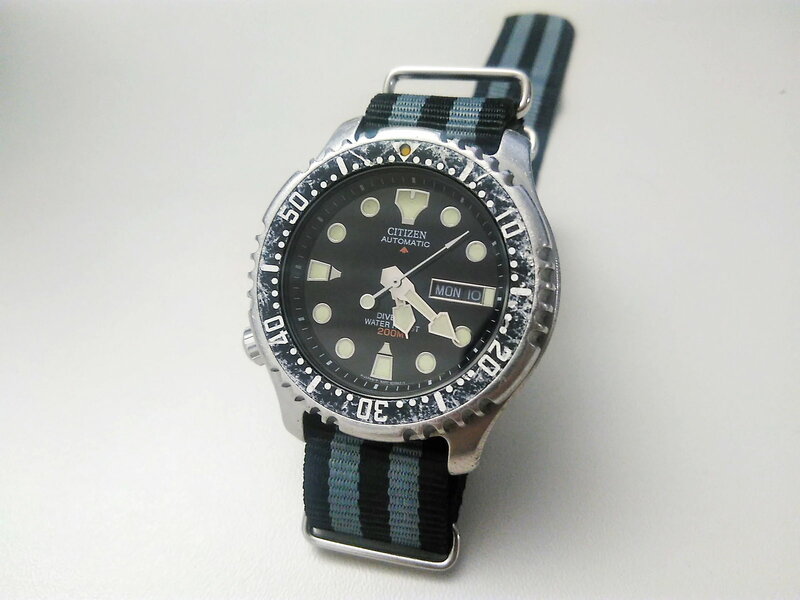 The final shot with a new Nato strap shows a watch that is a nice blend of old and new.